Cooking is something we're divided on at The Amazing Blog. Half of us are avid chefs, and the rest, well they would prefer never to turn an oven on again. What we do agree on though, is that a good cookbook can ease the battle of turning everyday ingredients into delicious meals, helping even the most unenthusiastic of cooks to rustle up a tasty dish. We have discovered the following cookbooks, each one guaranteed to contain a vast amount of recipes that will make your cooking restaurant worthy in no time! Firstly, we came across Eating Well Everyday, the brainchild of chef Peter Gordon. Originally from New Zealand, Gordon's extensive knowledge of cooking has stemmed from numerous culinary travels, through which he has gained inspiration to use Asian, Indonesian and Indian flavours. His passions have also led him to receive an ONZM (the equivalent of an OBE), notably awarded as a result of having organised a "Who's Cooking Dinner" event, which raised over £6.3 million for leukaemia research. We are therefore safe in the knowledge that this cookbook has been written by someone who truly knows how to cook (and has a passion for it). Written for "home cooks everywhere", this book contains 170 recipes, covering everything from breakfast to dinner party meals. Self-proclaimed to contain “tasty and daring, yet simple and straightforward" dishes, this is something we can vouch for. Even the most inexperienced of chefs amongst us were able to follow these recipes with ease (and perhaps even enjoyment). Our favourite dishes? The Chicken and Peanut Coconut Curry (page 166) and Pumpkin, Ginger, Chickpea and Cheese Soup (page 50) - both guaranteed to warm you up on a cold winter's evening. We also love the Peanut, Pecan and Chocolate Cookie recipe for a sweet after-dinner treat. To purchase Eating Well Everyday for £22, then click here. Secondly, we came across The Lazy Weekend Cookbook, a firm favourite amongst the less enthusiastic cooks of the office. Written by chef Matt Williamson, this book contains over 150 pages of delicious recipes for weekend cooking. Williamson explains that the goal of the book is to provide recipes that can be cooked leisurely, as opposed to the usual mid-week rush to get anything on the table. His advice is to choose a particular few meals to focus on, meaning you can rustle up some exceptional dishes, without spending all weekend in the kitchen. The book is structured into mealtimes and moments, ranging from breakfasts and brunches, to easy dinner party meals, and bakes. Each meal is designed for 4 people; however, we found it easy to scale this up or down, dependant on the situation. There are too many favourites to share, but the Quick Sesame Flatbreads with Honey Butter (page 29) and Moroccan Spiced Chicken Pie (page 54) are two stand out recipes that we couldn't not mention. We also like the weight and temperature conversions at the back of the book, meaning we have less chance of cremating our newfound recipes! To ramp up your weekend cooking, then you can purchase a copy of Williamson's The Lazy Weekend Cookbook here for £20. Finally, we discovered MOB Kitchen by Ben Lebus. Known for his online presence, Lebus' YouTube channel has grown a strong following, with an empire of over 250,000 social media followers in just 18 months. His niche? Providing meals for four people that are under £10. More recently, Lebus has extended this knowledge into a cookbook, aiming to encourage people to cook delicious and nutritious meals, that are still affordable. This concept is particularly popular among students and young professionals, proving that delicious meals don't need to cost a small fortune. By creating a cookbook, Lebus' new mission is to educate all ages, whether that be people who choose not to use social media, or those of us who simply like to have a physical copy at hand. The cookbook is segmented by time and goal, ranging from Brunch MOB to Speedy MOB and Flashy MOB. These contain over ten different recipes, amounting to 140 pages of recipes and visual guidelines. Each page has key symbols, with Spotify Codes on each recipe page, allowing readers to listen to the corresponding playlist/song. This is something we found interesting, tapping into the active social media tie Lebus has. We particularly enjoyed making the Chocolate Chilli Con Carne (page 94), and the Crunchy Vegan Aubergine Katsu (page 122) both of which stopped us from shelling out on unnecessary and expensive takeaways. 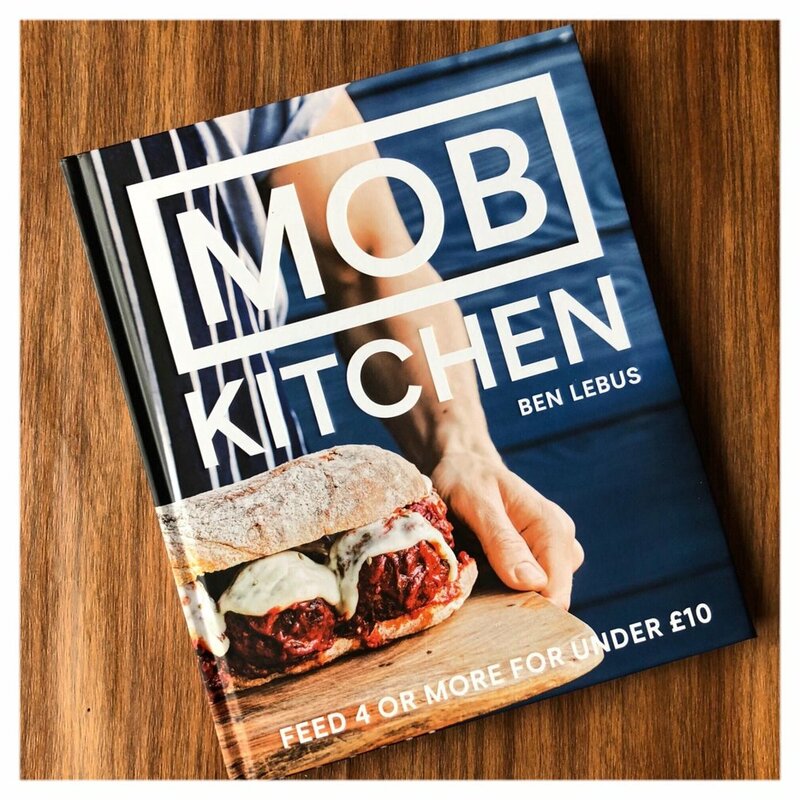 To purchase your own copy of MOB Kitchen, click here, where you can find ideas to get the mob fed for £14.99. These cookbooks have certainly helped us to eat better this November, with warming and comforting dishes that are easy to make, and reasonable to rustle up. Try them for yourself or we think these cookbooks would make a great Christmas gift for someone in need of spicing up their mealtimes. Happy cooking!